The dirt and wine in organic, natural and biodynamic wine production have a similar relationship to that of Brooke Shields and her Calvin Klein jeans. Photo by Richard Avedon for Calvin Klein Jeans. NEW types of wine seem to be springing up all over: Natural Wine, Organic Wine, Biodynamic Wine. Twenty years ago, people would have scratched their heads. Natural wine. Hmmmm. Is there an unnatural wine? Organic Wine. What’s an inorganic wine made of? Plastic?Let’s not even begin to think about biodynamic. Fast forward. These days in the age of Whole Foods Market, organic farming and improved consumer labels, people are growing increasingly interested in the how of food production. Where does the produce come from? How is it grown? Are there pesticides or additives? Wine production is no exception. Organic, Natural, Biodynamic – all these terms mean related but substantially different things about the how of wine. Here at GRAPE: Wine Talk, we’ll dispel the confusion. Remember those iconic ads in which a very young Brooke Shields claimed that nothing “comes between me and my Calvins [Klein jeans].” Well nothing – or very little – comes between the dirt and the wine from the vine in organic, natural, and biodynamic production. That’s the glib way of talking about terroir – the land from which a wine springs. Every vineyard is different. Every harvest is different. The minerals found in one parcel of land are different than in another. The insects and organisms in the dirt are even different. This difference, this balance of lime or clay or sand or quartz and water content and bugs shapes the grapes, and the grapes shape the wine. 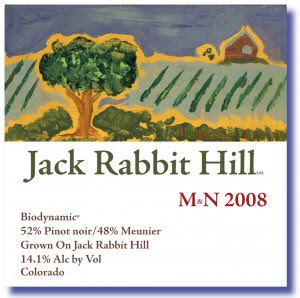 Jack Rabbit Hill Winery is one of several U.S. vineyards that produces both organic and biodynamic wines. Photo from Jack Rabbi Hill Winery. Do less to the grape when growing and the ground will express itself. That’s terroir. Do less to the grape when fermenting and the ground and grape will express themselves even more. Organic, Natural and Biodynamic wines are all about doing less to the wine, and the flavor changes dramatically. In general, drinking an organic, natural or biodynamic wine is like eating wild game: a little unexpected, full of flavor but surprisingly good once one adjusts to the nuance. Definitely an acquired taste. Untamed, unfinessed, from lands that have been de-treated of pesticides, such wines tend to be rather unusual. Truth be told, some do not like the raw, less-refined taste. Others say that this is the way wine was meant to be – the difference between downhome cooking and haute cuisine. Drink what you like. Change it up every now and then, just for kicks. But to tell the difference between organic, natural and biodynamic, let’s begin with the state of winemaking today. Frey offer natural wines for those with concerns about the source of their drink. Photo courtesy of Frey Natural Wines. chemicals to apply to avoid too much mold (must) and eliminate pests. Still the glory typically goes to the master chemists of the grape who tweak the juice just so. How much sulfur or potassium beyond the naturally occurring amount should be added to stabilize the wine, keeping it from sliding into vinegar over the years? Which types of yeast ought to be cultivated to produce consistency in fermentation? Does sugar content need to be increased to enhance fermentation and round out the taste? Then, there are other techniques to adapt acidity, etc. All of these are little tweaks a fine master chemist of the grape makes to shape the taste of the wine. It is an art, a fine one. And we love it. The booming wine industry is proof positive. But others say that such techniques common to conventional winemaking have gone too far. Wine production has gone industrial, to the detriment of the grape. Enter the organic, natural, and biodynamic difference. 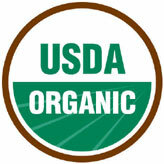 The USDA Organic is the seal that certifies that U.S. wines are organic. Photo courtesy of the USDA. with the produce. In order to receive the USDA Organic label, 95 percent of the grapes used in production must be organic, or those grapes that have not been subjected to a long list of banned pesticides. Period. There are some classifications of pesticides that are allowed, but this list is highly restricted. Recently in the United States, many vineyards that once grew grapes conventionally are now converting their lands to organic farming practices. So to find an organic wine, check the label. But note: organic winemakers are concerned with the grape. The juice can be tweaked as much as one likes. Rudolf Steiner is credited with setting out the principles that inform biodynamic farming. Photo from WikiCommons. “But wait,” the other members chide,” we can’t ban casks, too. That’s going too far.” ... “No it’s not!” ... “Oh yes it is!” ... “Oh, no it’s not!” ... And the debate goes on ad infinitum. Natural farming is about a principle, letting absolutely as little as possible get between the sun, the rain, the dirt, the grape, the juice, and the wine that comes out later. What happens to the juice is equally as important as what happens to the grape. consensus. Until there is, such winemakers will continue to debate, refine, and codify how to put principle into practice. Wine geeks encouraged to apply. Biodynamic wines are what one gets if one takes some of the principles of natural wine, adds a wicked dose of New Age Spirituality and still manages to have an international regulatory commission. Like the natural winers, biodynamic producers are concerned with principles. 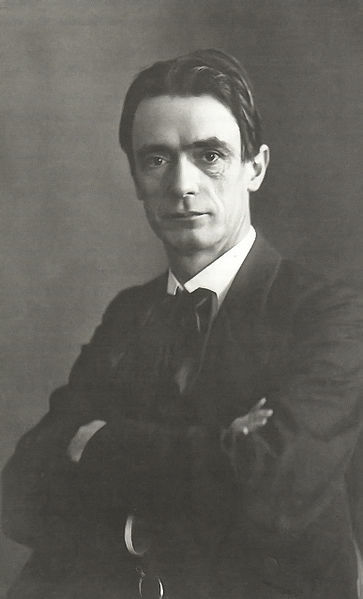 Most of the inspiration comes from Rudolf Steiner, a brilliant grade-A eccentric of the first order, who concluded that absolutely everything in farming has a spiritual principle, and that every farm is a self-contained unit. Animals and crops and humans form a little world – a closed ecosystem – and if that principle is respected, the land and all in it will live sustainably and harmoniously. animals living right there on the land, according to a precise system and formula. Cow horns (or an approved suitable substitute) filled with cured manure must be buried at intervals to replenish the soil. Consultation with astrological charts indicates the most favorable times to plant. Absolutely no pesticides can be used. Animals roam freely among the vines. 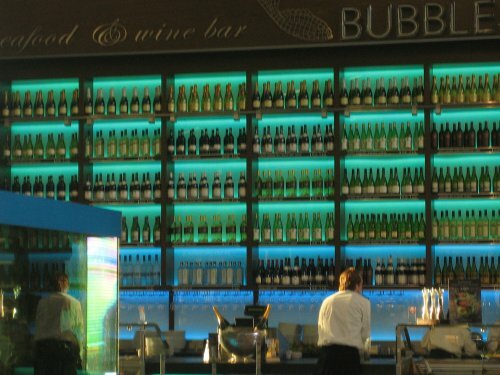 Does the enoceta (a sort of wine library) in Schiphol, Amsterdam keep any natural, organic or biodynamic wine in its large selection? That is the question. Photo by Jeff Wilcox. But before pooh-poohing the method note this: Demeter, the international biodynamic farming organization, is recognized by the European Union (EU), while other well-known and well-respected organic organizations are not. Further, one of the fastest growing movements today in EU is biodynamic vineyards. Note also that some organic winemakers are now also experimenting in biodynamic methods. Something must beworking. Q: What is one to do? of each: conventional, organic, natural, biodynamic. Look for the USDA Organic label. For a list of natural and biodynamic wines, see Fork and Bottle (http://www.forkandbottle.com/). Gather a group of friends. Pop and pour. Taste them all. Talk about them. Don’t think too much, just give your impressions. Find what you like. And enjoy. But most important, make sure to drink responsibly while doing so.